There are times where the only thing that can be certain is the outcome of a baking session in ones kitchen. Paraphrasing Julie Powell from the movie Julie & Julia, “when nothing is sure…you can come home and absolutely know that if you add egg yolks to chocolate and sugar and milk, it will get thick…” Those of you who have watched the film will know the outcome is a chocolate creme pie and it looks delicious. So last Sunday, when I was still 32 and with a smidge of trepidation about the upcoming week I knew that if I followed a recipe with a hefty wodge of my own idea, I’d come up with something delicious and uplifting*. I’m glad my over-confidence didn’t result in epic quantities of hubristic outcomes…and I share this with pleasure. 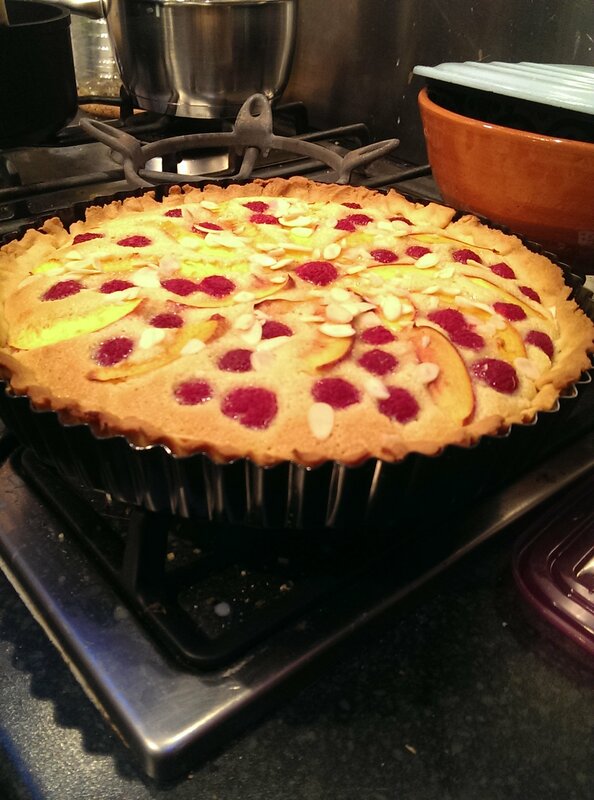 The frangipane recipe is taken from the BBC Food recipe for Pear and Apricot tart, by Paul Hollywood. You’ll need a 28cm loose bottomed flan dish and baking beans/dried rice or lentils. First make the pastry. Rub the butter into the flour until the mix looks like coarse breadcrumbs. Stir through the sugar and salt until combined. Add the egg/water mix, stirring until the crumbs form a ball. You don’t want the pastry too wet (like mine was). Using both hands, work the mix until a firm smooth ball forms. Wrap in cling film and chill in the fridge until firm. When the pastry is firm (about an hour), roll out until big enough to fit the loose bottomed flan dish. When the pastry is in, cover with grease proof paper and top with the baking beans/rice or lentils. Bake at 200C/400F/Gas 6 for 15 minutes. Remove the tin from the oven, take out the paper/beans and bake for a further 8 minutes until the pastry looks dry and the shine has gone. Remove from the oven and allow to cool. Reduce the oven to 180C/350F/Gas 4. Split the nectarines in half, removing the pit (no need to peel). Cut away any overly ripe bits – this is pretty as well as tasty. Slice each half into thin sections and set aside. You don’t need to peel nectarines but if substituting with peaches, peel them. Fuzzy fruit skin is not pleasant. In a large bowl, cream the butter and caster sugar together until pale and fluffy. Then add the beaten eggs, little by little until well combined. Mix in the flour and ground almonds and vanilla. In the cooled pastry case, spread the jam evenly over the base. Pour in the frangipane mix, making sure it covers the jam and is level on top. Arrange the nectarine slices in a fan pattern leaving spaces between each line of the fan. Fill in the gaps with the raspberries, gently pressing the fruit into the filling. Sprinkle with the flaked almonds and bake for 25-30 minutes. The filling needs to be set, check at 25 minutes and increase by 5 minute periods until no wobble is detected when the tin is gentle shaken. My oven needed the tart to be in for 40 minutes in total. Serve with whipped cream, creme frâiche or soured cream. *I gave a couple of slices to my mother-in-law. She described them as “truly uplifting”. This is the best compliment I’ve ever had.